Deep Tissue Massage is a form of massage that focuses on releasing the deeper myofascial restrictions of the deeper muscles, tendons and ligaments of the body. It is a specific massage, which employs techniques to work below superficial connective tissue with the intent of breaking up old structural patterns and allowing the free flow of nutrients and oxygen to the blood. Deep Tissue Massage includes the practise of Neuro-Muscular Techniques like palpation, trigger point therapy and ischemic compression. 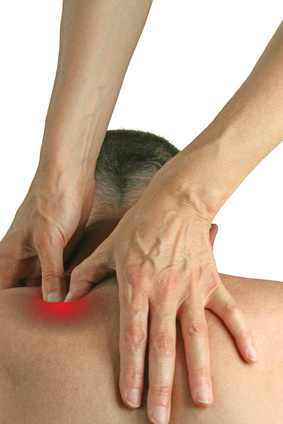 The therapist uses movements to release chronic muscle tension detected as restricted, stiff, knotted or painful areas. Slow and deep strokes, with more direct pressure by way of finger, hand or forearm is applied across the grain of the muscles to help alleviate the tension. The therapist may at times apply a considerable amount of pressure which in some cases may cause some discomfort to the client; however, the therapist will always work within the comfort zone of the client by consistent communication. Deep Tissue Massage is aimed at everyone. Most people develop some negative postural habits, all due to repetitive activites or mental and emotional influences on the body. Many people have occupations that encourage repetitive postures such as drivers, desk workers and computer operators. This often promotes gradual development of muscular imbalance leading to pain and tension. In addition those that work in a physically demanding environment or are involved in leisure activites that require a high level of muscular output, all often accumulate residues of lactic acid in their muscles, leading to stiffness and pain.